That’s when you’ve got the umbrella hood on. When you don’t, this innovative coat turns you into neo from the Matrix. Anyway, seen below is another odd fashion creature dreamed by some designer named Athanasia Leivaditou. The whole idea is an all-purpose ugly weather suit perfect for any kind of downpour. Just don’t walk around in pouring rain holding a scythe because it might scare the life out of people. 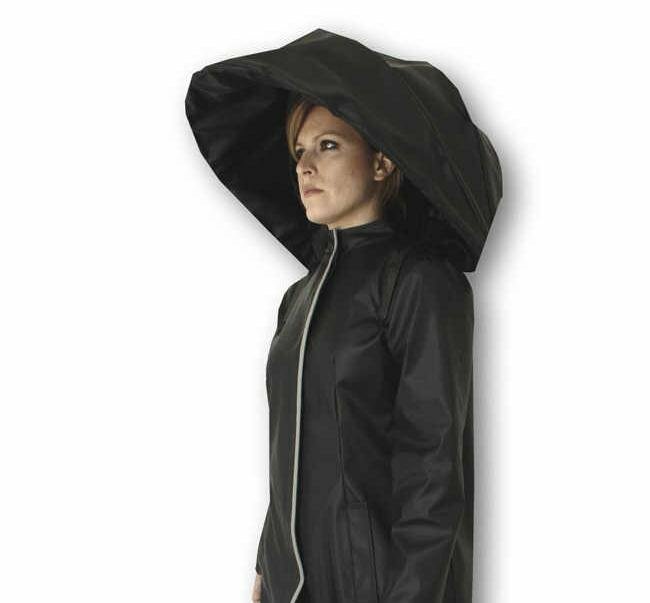 Kidding aside, the Umbrella Coat Raincoat (a redundant brand name if there ever was one) is modular and multi-purpose weather gear for anyone who thinks it’s a great idea to have free hands. See, once the umbrella hood is on and your legs are secure (it can be transformed into a tracksuit), them hands are pretty idle. So maybe you can still use them to carry things while it’s pouring. Since this is a concept, there’s no word yet if anyone’s ever going to manufacture these in bulk. To be fair, it’s a decent idea that should have the benefit of production. Who knows how much it can do to keep people from getting wet? Might also be cool if it’s inflatable so when floods come, people have instant live vests on. But this is wishful thinking, people.